Cute Small Dog Breeds – Which one is for you? 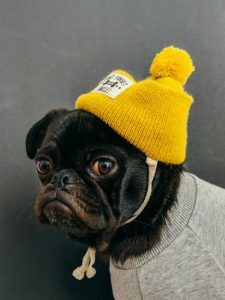 Hey there, In this post, I’m going to share some information about a cute small dog breed to give you some idea should you be thinking about getting a wee friend. 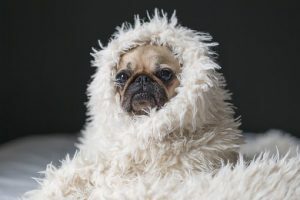 These are a lot of small dog breeds with different personalities, coats, colors and of course attitudes and today, I’m going to write about the Pug dog. 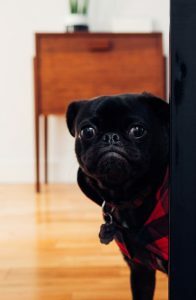 Hi, I am a Pug – What am I like? Well, I’m small and I’m definitely cute. 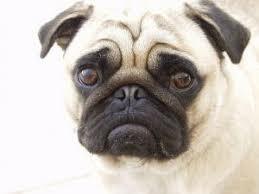 My breed name, Pug comes from the lain word meaning fist and you will see why in the photo below. My face kind of resembles a human fist. 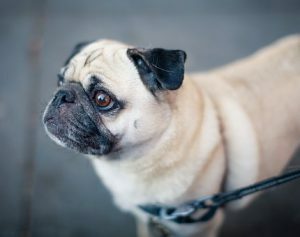 If you decide you want to buy a pug please make sure it is from a reputable breeder to ensure there are no genetic diseases, and a sound temperant. You won’t like it if I’m a sickly dog, nor will I.
I have a really funny face, pretty wrinkly with big dark eyes. Yes, but what am I like? I’m only about 12″/30cms when I’m fully grown. I weigh around 6kgs – 7,7kgs / 14-17lbs, and I live anywhere from 12-15 years depending on my health so feed me really good nutritional food, recommended daily amount of dry food each day: 1/2 to 1 cup, divided into two meals. Make sure I’m vaccinated regularly and deworm and deflea me regularly. I have a short, double coat, and I shed profusely, so being groomed regularly is a must with me. I have a great sense of humor, often called a clown and as a cute small dog breed, I’m really funny. I love people and I love showing off whenever I can. I am irresistible when if you have children and will make a great friend for you. Because I’m so small I can live in a townhouse or apartment no trouble at all, although I don’t like being left alone for too long. I love companionship and I can become really sad. I love other dogs and love to socialize. Please don’t overfeed me as I tend to put on weight very quickly which is not good for my health. I don’t need lots of exercises as I am so playful, I can usually tire myself out, although a walk is always good for me and you too, of course. I am not a continual barker, however, if I have to, will always let you know something is amiss. I am highly intelligent. and learn as you teach me as long as you have patience and a kind voice which I’m sure you will. I don’t tolerate being too hot or cold so when it’s cold, I may need a jacket to help me keep warm and when it’s really hot, please keep me shaded inside preferably. Here a few photos I thought you might like so you can see how cute I really am! Health- What do you need to know about? 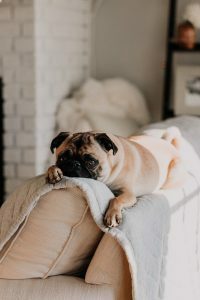 Not all Pugs are prone to illness however it is always good to know what health issues they can have before you decide to buy one. Cheyletiella Dermatitis, Epilepsy, Nerve Degeneration, Dry Eye, Corneal Ulcers, Allergies, Staph Infection, Yeast Infections, Demodectic Mange, Hip Dysplasia, Patellar Luxation, Legg-Perthes Disease, and vaccine sensitivity. I won’t go into these illnesses in length on this post. 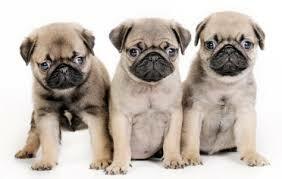 You can do some research on these if you like and I’m not saying all pugs will get any of these. I’m merely sharing information with you. Socializing – What do I enjoy? Puppy School will be excellent for me, and be able to socialize, learn new skills and have fun. Did I mention I’ll meet some new friends? I love friends. When you 1st take me home, please invite your friends to come to meet me and tell them to bring their doggy so I can have some play time. Also, can you take me for walks with my new friends? I’d love that immensely. I’d love you to buy me some toys too. I’ll show you how thankful I am and I’m sure you will get some laughs. Being a cute small dog and being a pug means anything social and I’m there. Sleeping – Who you or me? Well, I can assure you, I’m a great sleeper, however you might like to put my bed quite a distance from your bedroom as I snore and grunt and can be heard quite easily, so if you are a light sleeper you might want to take my sound advice. I know one thing is for sure I will bring you so much joy and love you unconditionally so what are you waiting for. Are you ready to come and find me? I hope you enjoyed this blog and please feel free to ask questions or leave a comment and get I will back to you.